Kicking off May 6 at Red Rocks the tour will cross the country and back with stops at Austin 360 Amphitheater, The Fox in Atlanta, Coney Island Amphitheater in Brooklyn, Northerly Island in Chicago, Greek Theaters in San Francisco and LA and many more before ending July 7 in Phoenix. A full list of tour dates can be found below. 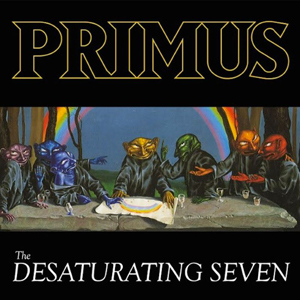 The Desaturating Seven led PRIMUS back to some of the sounds and styles of their earlier days and has received praise from Consequence of Sound, Rolling Stone, AV Club and more. 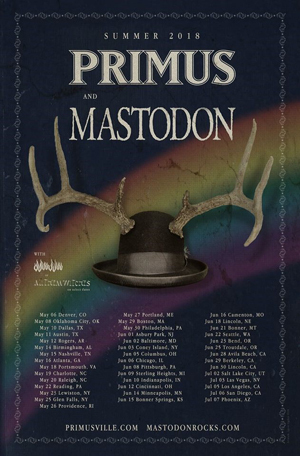 The album marks the return of the definitive PRIMUS line-up—singer/bassist Les Claypool, guitarist Larry “Ler” LaLonde, and drummer Tim “Herb” Alexander—for its first album of original music since 1995. Inspiration for the album came from a 1978 children’s book called The Rainbow Goblins by the Italian author and artist Ui de Rico. In the story seven goblins come to the valley where rainbows are born, intending to steal the rainbows and eat them. The valley, though, knows that the goblins are coming, and makes a plan to thwart the wicked creatures by hiding the rainbow. After the goblins are caught in their own nets, the flowers release the colors of the rainbow and drown the goblins, and in gratitude, the rainbow turns the flowers into beautiful birds who fly across the valley in freedom. Watch "The Seven" Video On KNAC.COM HERE.